After writing, reading, re-reading and mulling over my preceding post -- “Minutes of Assad-Annan new truce deal” -- I thought Kofi Annan’s title should be changed from Joint Special Envoy of the UN and Arab League for Syria to Joint Special Envoy of the Russian Federation and Islamic Republic of Iran for bailing out Bashar al-Assad. Judging from editorial comments in the regional press, my opinion is shared by many. I counted at least six columnists today questioning Annan’s approach, job performance and mandate. A third, Rajeh el-Khoury, writing for Lebanon’s independent newspaper an-Nahar, accuses the special envoy of closing his eyes to the “step by step killings” in Syria. Also writing for Elaph, Nohad Ismail says, “Absurd maneuvers and sterile meetings will lead Annan nowhere. He will ultimately discover that he was led to play the role of a halfwit duped by a cunning tyrant sitting in Damascus. Ismail says, “Annan would have done much better to go to disaster areas in Idlib, Rastan, Deraa, Hama and Deir al-Zor, among others. He would have done much better to tour Syrian refugee camps in Jordan and Turkey, if only to hear stories” like Umm Qusay’s. “Umm Qusay” refers to a mother in Atarib, Syria, called Amina. She described in graphic detail to The Daily Telegraph’s Ruth Sherlock how government forces tied a rope around the leg of her disabled son Qusay, dragged him through the streets, beat him until unconscious and then shot him dead. According to renowned political analyst Abdelwahhab Badrakhan, Annan wasn’t mourning his mission when he had a good cry in his recent interviews with France’s Le Monde and the UK’s Guardian. In effect, Badrakhan writes for al-Hayat, the special envoy was sobbing to win an extension of his mandate. 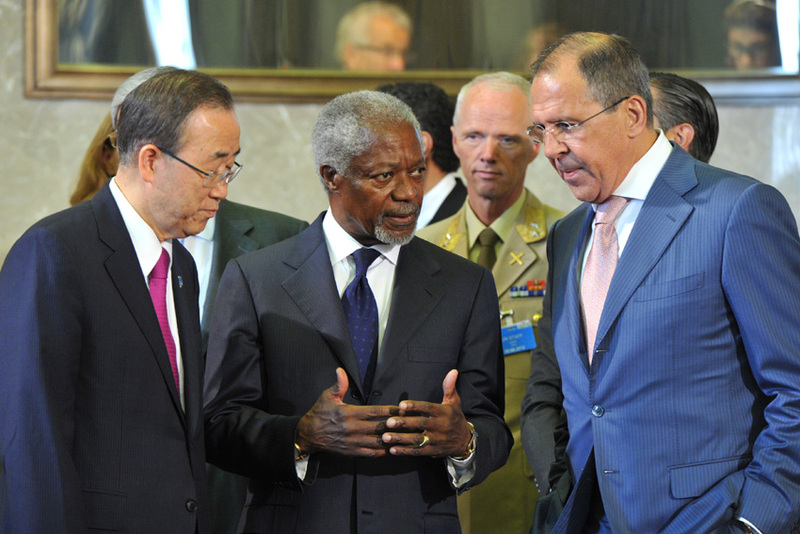 “Oddly, Annan blames his failure on the Friends of Syria, who – unlike Russia and Syria’s regime – didn’t lend him a hand. He thought he only lacked Iran’s help to succeed. Badrakhan says Annan is daydreaming if he thinks he can sell the Syrian people a hollow political process cobbled together by Assad, Russia’s Sergei Lavrov and Iran’s Qassem Soleimani. Were all the Syrian people’s sacrifices made to win a dialogue with a killer regime on how best to keep it in place? Al-Hayat’s Hassan Haidar in turn says, “Notwithstanding Annan’s excuses for flying to Tehran and declaring Iran can play a ‘positive role’ in resolving Syria’s deepening crisis, the trip was a departure from his mandate, which is based on the Arab League roadmap for a transition in Syria that was endorsed by the UN Security Council. His shuttles have turned into time wasting pending military and political developments and the fate of the UN observer mission, which is already on its deathbed. 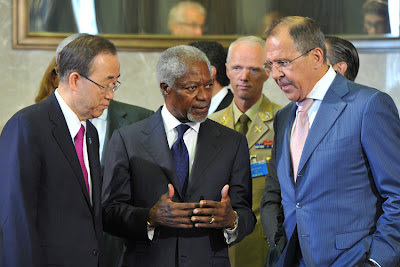 “The Syrian National Council’s talks in Moscow yesterday confirmed that Annan’s improvisations are leading nowhere. Moscow, as the Syrian opposition found out, is not yielding an inch on its support of Assad. So how does Annan expect Iran, which is up to its ears in defending Damascus’ ruler, to play a ‘positive role’ in anything to do with a political transition meant to lead to regime change?